This bone is one of the accessory or “extra” bones that occur in the foot. Accessory bones also go by the name accessory ossicle simply because they tend to be small round bones. I have read in a couple of sources that approximately 20-26 percent of the population exhibit this particular accessory bone. Unless there is pain in the area, a finding of this extra bone is considered an incidental finding. Pain from this accessory bone occurs more infrequently than pain from other pedal accessory bones such as an os tibiale naviculare, ostrigonum, or sesamoiditis. 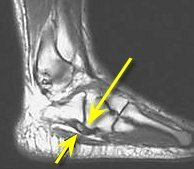 This particular accessory bone is usually found within the confines of the peroneus longus tendon on the outside of the foot just behind the flare of the fifth metatarsal base. It is usually just lateral to the third cuneiform bone. This bone should not be confused with the accessory bone of the fifth metatarsal base known as the os vesalianum. The picture below shows the approximate location of pain that may occur as a result of trauma to the os peroneum or inflammation of the bone from shoe pressure or part of the problem in inflammation of the peroneus longus muscle, also known as os peroneum externum syndrome. The xray and MRI images further down this article also reveal the location of an os peroneum within the foot. In simple cases of inflammation of this accessory bone the source can usually be attributed to the type of footwear a person wears. When measured for shoes, most people look at the width of a shoe at the level of the metatarsal heads (the ball of the foot), but many shoes may actually be too narrow in the mid portion of the foot. This situation tends to create pain at the level of the flare of the fifth metatarsal base, but certainly those with an accessory bone in the same general area will be subject to irritation of the os peroneum. Obviously, this is remedied by identifying the shoes causing the irritation and avoiding them. The next most common source for irritation of the accessory bone is the overall irritation of the peroneus longus tendon from within the accessory bone resides. This can be a little more complicated in that peroneal tendon problems may be either from trauma to the outside of the foot, or from abnormalities in a patient's gait cycle, creating an overload on the peroneus longus tendon and ultimate pathology to the tendon and the accessory ossicle. In these cases the underlying biomechanical issues have to be addressed to take the strain off the peroneal longus tendon and the associated inflammation may be addressed through the use of oral anti-inflammatory medication, rest, some physical therapy and the possibility of cortisone injections. Rounding out potential problems with this accessory bone is the possibility of fracture. This can be a difficult diagnosis to make with simply an xray. Fractures of this bone are uncommon and at times may be mistaken for a bipartate sesamoid which is actually two bones residing in the same location instead of the customary one bone. Usually a bone scan or more likely an MRI will be necessary to make the diagnosis of fracture. In cases of os peroneum fractures, these are not the type of fractures that generally heal with immobilization and casting although it can certainly be attempted. More than likely these small round bones will need to be surgically removed. There are very few contraindications to surgical removal as they serve no real purpose in the function of the foot and the actual surgery may be performed under local anesthesia if the patient has medical issues that preclude general anesthesia.